18 Ultimate ½ pint substrate Jars- Pressure sterilized and ready to grow! Mega Growing, Incubating Chamber System- with air exchange holes - 56 Quart size! Grow up to 30 jars at once! 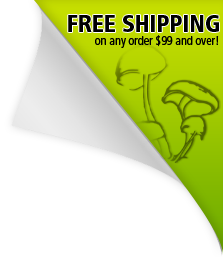 Midwest Grow Kit's Mega Mushroom grow kit is the biggest shippable mushroom kit on the market today! Look around! If quantity is what you desire look no further! This mushroom kit comes with 18 jars but can hold up to 30 at once! With 3 cubic feet of room the Mega Mushroom kit comes with a hydroponic humidifier to ensure perfect humidity levels and air exchange without over-saturating. This kit is completely automated! Perfect temperature and humidity are easily achieved for each stage of the process! Set it up in minutes! We make growing mushrooms easy! All of our kits are extremely easy to use and require only 1 step to start your mushroom adventure! Grow your exotics or edibles in Mega quantities! This mushroom growing kit will be used as an incubator during the first few weeks. This allows for faster colonizing times! This kit will obtain perfect temperature and humidity levels without you ever being around! Almost everything included with this kit can be re-used to set you up for many future grow projects including bulk mono-tub grows and more! Ordered the mega grow kit and have been satisfied with my purchase! i did receive one broken jar but sent an email to customer service and got a timely response letting me know they would take care of it at my convenience. I don't see any reason people would deal with anybody else for their growing needs! I cannot say how pleased I am with this kit! Super easy to set up and that's alot coming from me! :) I highly recommended this!! Received the entire kit incredibly quick. Received the entire kit incredibly quick. Was able to get set up and running same day with exceptional confidence because of the instructions included and the videos provided through their website. All my jars had growth after 4 days and I couldn’t be happier. I went with a different company for my last grow kit and was very dissatisfied. This is worth the investment and the service is top notch. Great Products And Guidance For Great Prices! I decided to start a new hobby. LOL. I happened to stumble upon Midwestgrowkits.com. I became intrigued with the idea of starting my own research facility. I invested in this grow kit and I am very pleased with the results. The kit includes everything you need to get up and running. I am a novice for sure and have had some issues starting up. But with the videos and customer service support, I think I got it almost figured out now. The kit could have a bit better materials, but that would make it more expensive I would imagine. But I'm very happy with the items in the kit. Maybe one day I will upgrade to a bit better air pump and heating mat. But other than that I am very happy with my purchase and I'm super excited about my new hobby. I want to Thank Midwestgrowkits.com for all their help and I'm excited for the future! This is the second time I have ordered this kit and the only thing different are improvements! I was extremely pleased with my first order and when I got this one I was expecting the same products, however, the heating mat is different now, the directions are new and just as informative, and there are a few other things I can’t think of off the top of my head. Either way the shipping is very fast, the products always come undamaged and packed inconspicuously. Will order time and time again from this company: thanks Midwest!